I really, really enjoyed this book! I don’t think there has ever been another book that sucked me in from the first chapter like this one did. That first chapter was so well written yet so devastating that I just wanted to keep reading about these characters and the after effects of what happened to them. What I enjoyed the most was this wasn’t a typical thriller type book. While there were definitely elements of a thriller, and twists that caught me by surprise, it was more a family driven drama about the aftermath of not one, but two, tragedies. The story had layer after layer of story as I kept reading. I was so very invested in each character and their story. It was a 500+ page book and I read it in 6 days. I couldn’t wait to get home from work so I could read more and I was even reading on my lunch breaks. That is when I know I am reading a great book! I read it for book club and I can’t wait to hear what everyone else thought about it. I don’t want to give any spoilers away so I will stop my review here but do yourself a favor and get this book! 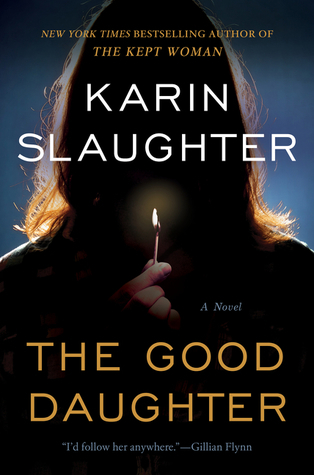 This is the second one of her books I have read and loved them both so bravo to Karin Slaughter! I can’t wait to read some of her other novels.